We are excited to announce our newest feature — CrewSense Auctions. Within this module, you will be able to set up a bidding process for things within your department or company, such as annual vacation picks. Using the CrewSense approach, all employee notifications, bids, approvals and times will be handled automatically for you. This feature is designed to completely and totally automate a process which used to require paper, pencil, hours on the phone and a lot of headaches. Now, CrewSense can do the entire process for you. Once the auction is started, the auctioneer can sit back and watch the process happen in real time, all without picking up the phone. 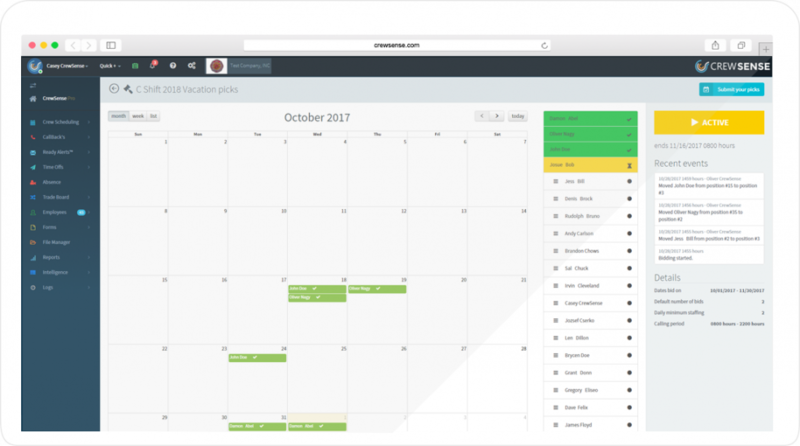 Days spent making sure that vacation picks are done correctly are now a thing of the past. Just configure some simple rules and let the platform do the work for you! You can set the time off type based on your systems created types. Pick a date range for your the auction. Fill out some remaining options, then click Create Auction, sit back and watch the magic happen! For now, the system only allows bidding for work types. In the future, we’ll be updating this module to allow for complete customization of the auction process and rotational bidding. Bidding for a shift? A specific work station? It’s all in the near future. So sit back, enjoy that cup of coffee and we’ll handle all the dirty work for you.